Thank you for your well thought words that will absolutely inspire other students. 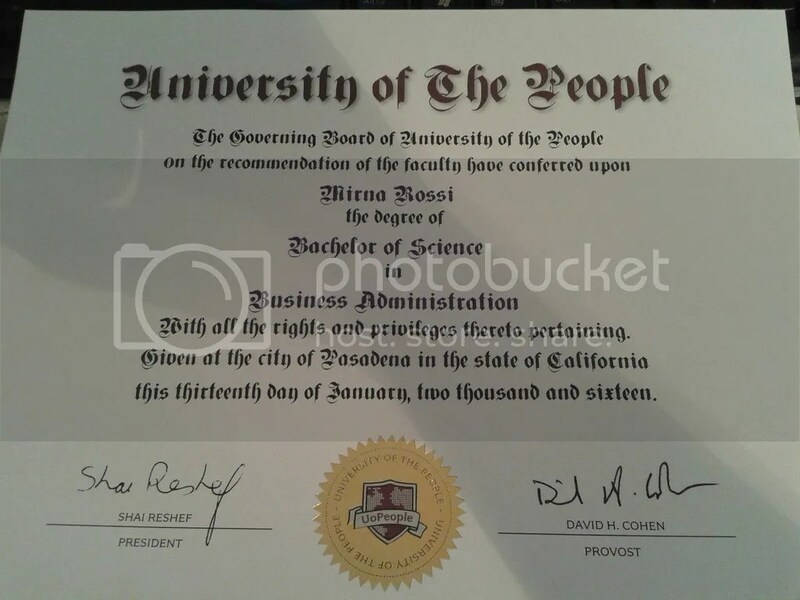 I am also a student of UoPeople, continuing my pursue of a bachelor degree after 5 years of interruption. Reading your blog makes me really believe in the day I will officially receive the diploma like you did. We share the shame difficulty, the same situation, same school. I hope some day I will be like you. Dear Vy Nguyen Hoang, I do really appreciate your comment and the fact you took your time to write a comment. The experience at the UoPeople is unique and all the students join a sense of “sharing” that goes beyond boundaries. This is so powerful and your words are a proof of that. Do not hesitate to contact me in case of need; I’m here. Hi Mirna congratulations and thanks for this inspiring blog post. I just discovered UoP and I am starting in September for a degree in Computer Science. I have a question, why are you calling the certificate a diploma? Is it not a degree? yes, I shared this “last” step and once again, I hope my journey will help others to achieve their dreams. You’re doing great with your blog, your studies and your family. Definitely, we also represent a huge&colored family…all around the world. You deserve the best Mirna! Congratulations to you on your new achievement. You are a great source of inspiration to many of us. We will “keep burning the candle at both ends”. “being a source of inspiration” is one of the best comment I would ever receive. Your post was an eye opener for me & i’m more projected to making same success story at UoP. Each line I read were inspiring that I must confess & thanks for taking time out to do so okay. My scepticism is far gone & am geared towards commencement of lecture in June, cheers. My scepticism is far gone & I am geared towards commencement of lecture in June, cheers. I really appreciate your comment and your candidness. You’re going to face to the most exciting adventure in your life. Be proud and enjoy each moment of that incredible journey. It’s worth it.